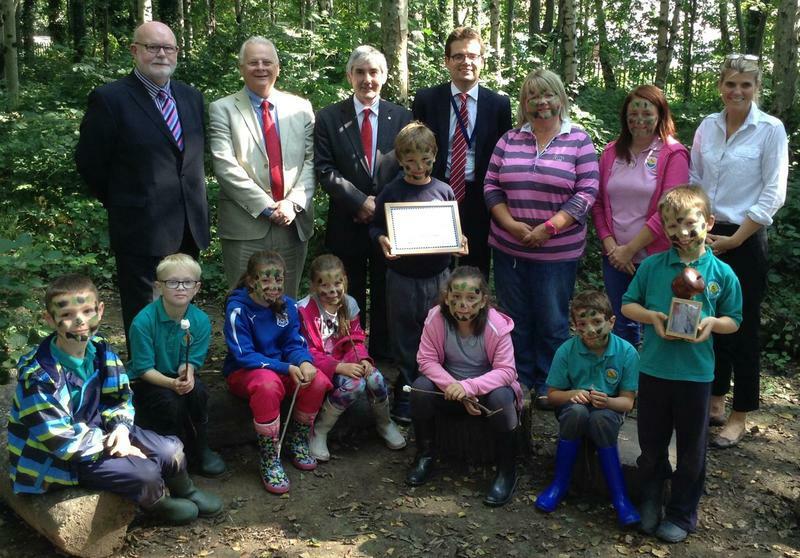 We are really pleased to announce that Pencoed Primary School has won the Excellence in Forestry School’s Award for 2015. This is a national award and it was open to all schools in Wales. Two judges from the Royal Forestry Society visited the school at the end of last term and watched some forest schools sessions and met with parents and pupils. They were very impressed with what they saw and described our practice as “inspirational”. I am very proud that tour hard work has been recognised and celebrated in this way and I look forward to developing outr Forest School provision even further. Please see the full article from the Royal Forestry Website below. The breadth of work with school children and the community in their own school woodland impressed the judges - Sue Williams, who heads up the Education, Learning and Sector Skills Team for Natural Resources Wales, and Phil Tanner, Education Manager of the Royal Forestry Society (RFS). Pencoed School has around 570 pupils. Its woodland was planted 24 years ago by students and staff as a resource for learning opportunities not just for the students attending the school but the whole community. Judge Phil Tanner said: "This inspirational work to ensure that Pencoed School is more than just a school is supported by both the school staff and the parents of the children. Leading the school's engagement programme is local resident Julie Jenkins whose enthusiastic approach to providing outdoor learning opportunities is at the heart of the school's success." Pencoed School provides opportunities for children of all ages to develop personally in an outdoor environment and places an emphasis on curriculum design centred on the use of the schools woodland. Pencoed's work has been supported by local partnerships and school pupils visit the local Rockwool site where they participate in education sessions with Natural Resources Wales staff to gain an understanding of the value of local woodland sites. The school's partnership with Bridgend College saw an excellent example of teaching and learning for all involved when college students delivered Forest School sessions to Pencoed pupils. Head teacher Ms Sarjeant said: "At Pencoed Primary School we strive to promote family involvement and to support and create partnerships with the families in our school. Using our Forest School Area for this has been a key aspect of our development this year. Showing the value of using woodland areas for all aspects of learning has inspired and motivated many of our families to get outside and enjoy nature! "The award will help us promote this resource further and ensure it is sustained for future generations. I am thrilled that the hard work and dedication of all involved has been recognised." Family Engagement Officer Julie Jenkins added: " I am delighted we have been recognised for the positive approach we have in engaging our families into the life of the school and their children’s learning. Using our outdoor learning environment has proven to be very positive for many families, allowing children to learn and develop in a stimulating and natural environment. Our thanks to Faye Williams our Forest Schools Leader with whom we have worked closely on all these projects. I look forward to developing our programmes further in future."